At Trocaire, many students are pursuing nursing or health science degrees—fields in which students have to be able to apply what they learn in a clinical setting, proving retention even more challenging. In 2015, Trocaire administrators and faculty took a closer look at the research linking student engagement to retention and outcomes, and decided to emphasize student engagement as a critical lever to success. Instructors and students were provided access to the Echo360 platform, making it easier for students to interact with content, instructors and peers, and for instructors to use student learning data to help struggling students in real time. Initially, Trocaire focused retention efforts on online courses that had the highest attrition rates; today, thanks in part to the College’s innovative grant program, the platform is being used by over 30 full-time instructors in both virtual and face-to-face classrooms. For nursing and the health sciences, freeing up class time for practical, hands-on learning is critical to both student engagement and the application of their learning. This proves especially important and challenging in many large enrollment gateway courses. Research shows that students that are academically unprepared or come from disadvantaged backgrounds are most likely to struggle in these gateway courses, and drop out altogether. By targeting students in gateway courses and helping them develop critical thinking and applied learning skills early on, faculty and advisors can put students on a strong path to success. For this reason, Trocaire began by targeting these courses with the highest attrition rates, such as Anatomy & Physiology-- a gateway course to all the other courses in the health sciences professions. At Trocaire, instructors are using the platform to help flip their classroom—giving students material and lectures to read in advance, leaving class time for discussion, applied learning, and collaboration. Trocaire instituted a grant program to get faculty thinking creatively about new ways to engage students and measure results with the Echo360 platform. The grants act as mini-research projects. Awardees are required to define goals measuring the specific outcomes and impact of the technology in their classroom. Goals must be specific, measureable, and achievable within the current semester. 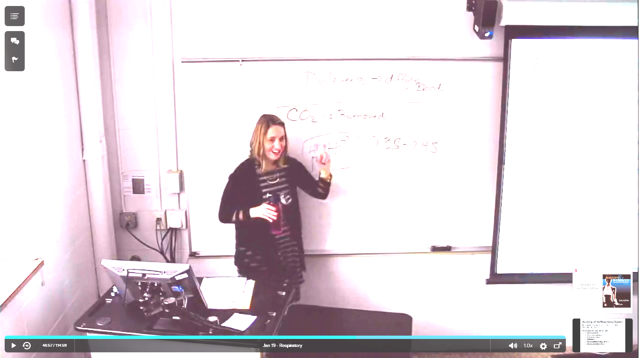 “Another instructor uses Echo360 to flip her radiological technology labs. She’s creating videos with our staff videographer using high-definition cameras. The videos demonstrate the proper positioning of patients, how to identify bones and other body features from different positions so they can image it correctly for the doctors. We love that we can create these videos, upload them through Echo360 into our LMS, see that students are watching them, and measure the level of engagement with the material. It’s just phenomenal for us as our goal is to measure the impact of both the technology and the method of instruction,” says Steele-Pruitt. Learn more! Click on the icon below to watch Alissa Steele-Pruitt's presentation from our Boston Active Learning Conference.